At 4-1 in the ACC with plenty of winnable games left, Chris Mack's Cards are surpassing preseason projections. LOUISVILLE (WAVE) – Heading into Thursday night’s home game against N.C. State, the University of Louisville men’s basketball team is averaging 15,816 fans per game in the KFC Yum! Center, a drop of 5,030 from Rick Pitino’s final season in 2016-2017. All sorts of reasons have been floated in the media. Surely some of the 5,030 are protesting the scandals that have plagued the program during the last couple of seasons under Pitino. Others are protesting the firing of Pitino and athletic director Tom Jurich. And then there’s the cost of tickets, donations and concessions. Suffice it to say that many UofL fans have simply been priced out of the market. They are content to stay home and watch the games from their recliners and couches. 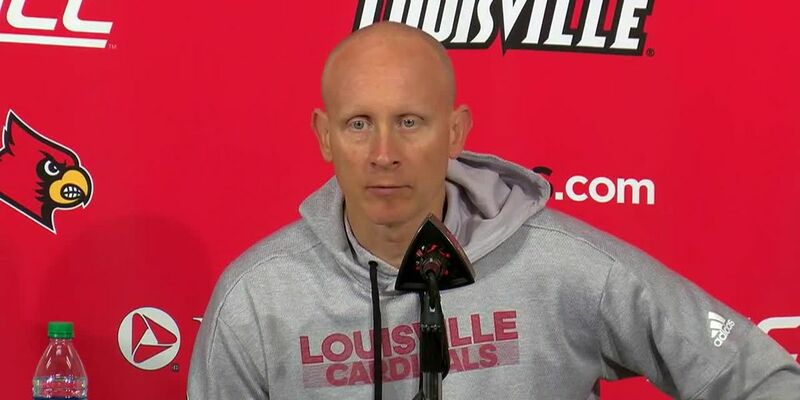 Finally, new coach Chris Mack lacks the glamour and star power that Pitino brought to every game he coached. More than a Hall-of-Fame coach, Pitino was a celebrity who liked life in the fast lane. I understand the thinking behind all these reasons, and I commend Athletics Director Vince Tyra for asking the public what can be done to get the Cardinals back to their accustomed place among the nation’s top five in home attendance. Well, the Pitino and Jurich loyalists might as well get over it because neither of them is coming back. Those worn out by the scandals of the past will get over their disappointment and anger sooner or later. Some tweaking in ticket and concessions prices could be construed as a goodwill gesture that might sway some of the disenchanted fans. But the main thing is to make the missing fans understand that they’re missing out on what could be a special season in UofL basketball history. With 13 Atlantic Coast Conference games left to play, the Cards are 13-5 in all games and 4-1 in the league. This means they have to go 7-6 to reach the 20-win mark and 5-8 to finish at .500 in the nation’s toughest conference. Generally speaking, an ACC team with 20 wins and a 9-9 league record will get a berth in the NCAA tournament. If Mack accomplishes that in his first season, he should be a candidate for national Coach of the Year, given the dire preseason predictions for the Cards. The Cards have three very good wins – at Seton Hall, Michigan State at home, and at North Carolina – and no bad losses. Even their upset loss to Pittsburgh on the road doesn’t look as bad as it did at the time, given the Panthers own a 12-6 record and a stunning upset of Florida State. Looking at the last 13 games, I can see seven wins, beginning with N.C. State. The others will be Pitt at home, at Wake Forest, at Virginia Tech, Clemson at home, at Boston College, and Notre Dame at home. I also can see five losses – at Florida State, Duke at home, at Syracuse, and Virginia home and away. The swing game is North Carolina at home on Feb. 2. Yes, the Cards embarrassed the Tar Heels in the Dean Dome. But that will only be a motivating factor when they meet again. If the Cards can do it again, however, we’re looking at a possible record of 21-10 heading into the ACC tournament. Obviously, I’m engaging in some risky business here. With so much regular-season basketball to be played, an injury to an essential player can ruin any team’s season. But the point is, the Cards are back in the national mix. Barring a complete breakdown, they have an excellent chance to make the NCAA tournament, the season’s No. 1 goal. It’s not my job to help UofL sell tickets. Neither is it my job to chastise those who have chosen to bail out, for whatever reason. All I’m saying is that the basketball program has turned the page, good things are happening this season, and the future looks incredibly bright, considering that Mack’s recruiting class is ranked No. 2 in the nation. As the season has unfolded, almost every player has gotten better. The big men, 6-foot-11 Malik Williams and 6-10 Steven Enoch, have learned from each other. Samford transfer Christen Cunningham has been a joy to watch at point guard, and 6-5 Dwayne Sutton has been a force on both ends of the floor. And then there’s Jordan Nwora, the 6-7 sophomore who will certainly be a draft pick when he’s ready to go pro. Shooting guard Ryan McMahon and swingman VJ King, both juniors, have struggled, but the crowds still love them and are hoping for big games from each. The Cards are good passers, good shooters, and good defenders. They have responded well to Mack and his staff. And their best games may be ahead of them. If they make the tournament, they will not be an easy out. Even if the home crowds don’t pick up – and they should, given the quality of the opponents – Mack’s first team has earned the right to be supported. So the good times are ready to roll again in the Yum! Center, and the 5,000 or so defectors might want to consider rejoining the party.